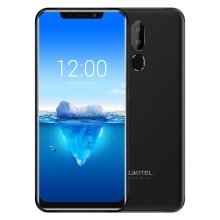 The OUKITEL C12 Pro comes with a big 6.18-inch display on the 2.5D polished tech surface, wide horizon offered when enjoy your video and pictures, besides, it provides soft and icy touch feelings. The C12 Pro features an 8MP+2MP dual-lens rear camera for capturing the beautiful moment of your life, while the 5MP front camera record your beauty as well. Powered by the latest MT6739 Quad Core processor and smart GPU to offer smooth and comfortable use experience. The C12 Pro runs the advanced system – Android 8.1 OS, more smarter and faster, which helps you enjoy each interface freely. The C12 Pro can fast recognize your face details and record your fingerprint for unlocking smartly and safely. Built in 3300 battery with low consumption, long-lasting companion for a whole day use. Other Functions: Dual SIM, BT, Face ID, Micro USB,OTG, WI-FI, GPS, etc.